Bodhgaya, Bihar, India – When His Holiness the Dalai Lama arrived at the Kalachakra Maidan this morning, he was greeted as usual by thousands of smiling faces and folded hands. He returned the smiles and saluted some old friends. From the edge of the stage he waved to more distant members of the audience and they waved back, some even jumping up and down for joy. 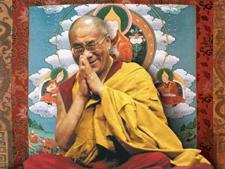 After greeting old friends among the Lamas on the stage, His Holiness took his seat on the throne. The ‘Heart Sutra’ was recited in Chinese. “The Pali tradition, with its exemplary Vinaya traditions, spread to countries like Sri Lanka, Burma and Thailand. The Sanskrit tradition in the way it was followed at Nalanda spread to China and from there to Korea, Japan and Vietnam. Later it was carried to Tibet and on to Mongolia. China was therefore among the earlier countries to which Buddhism spread. Nowadays, wherever in the world there are Chinese, they set up a Buddhist temple, which shows how close Buddhism is to the Chinese heart—it is China’s traditional religion. His Holiness expressed his admiration of the fact that all the world’s major religions flourish in India. What’s more, these different religious traditions, indigenous and from abroad, theistic and non-theistic, live together in respectful harmony. “I’m a Buddhist monk,” he said, “but I respect all religious traditions. The key thing is to be sincere and to put what you believe into practice. All these different traditions teach love, compassion and tolerance even if they hold different philosophical views. While I have immense respect for Buddhist philosophical positions, I never say that Buddhism is the best tradition. To do so would be as mistaken as saying that one particular medicine was the best for everyone in all circumstances. As he took up the text of the ‘Diamond Cutter Sutra’, His Holiness explained how after attaining enlightenment the Buddha declared ‘Profound and peaceful, free from complexity, uncompounded luminosity—I have found a nectar-like Dharma. Yet if I were to teach it, no-one would understand, so I shall remain silent here in the forest.’ However, when they met again, Kaundinya and his former companions requested him to teach. He explained the Four Noble Truths in terms of the four characteristics of each truth, as well as the 37 Factors of Enlightenment. These are clearly recorded in the Three Baskets of the Pali Tradition. Pali was the language of the first council at Rajgir during which the Vinaya was compiled. Later, the Buddha gave the Perfection of Wisdom teachings on Vulture’s Peak that came to be recorded in Sanskrit. His Holiness clarified that the teachings found in the Pali tradition were those that had been given openly in public, whereas those of the Sanskrit tradition were given before a more select gathering. Where the teachings of the Pali Tradition form the very foundation of Buddhism, the Perfection of Wisdom teachings are the Buddha’s supreme instructions. He explained that of the ‘Fundamental Wisdom’s’ 27 chapters, if you were to read chapters 26,18, 24 and 22 you would come to understand how we fall into cyclic existence, how there is no independently existent self, and how things have no objective existence, but are interdependent. He also commended his Chinese listeners to make themselves aware of the Chinese translations of Aryadeva’s ‘400 Verses’, ‘Buddhapalita’ and Chandrakirti’s ‘Entering into the Middle Way’ and ‘Clear Words’. 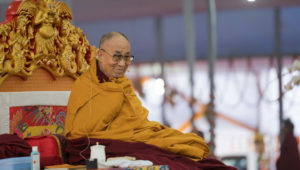 His Holiness noted that during the first turning of the wheel of dharma, the Buddha explained that there is no permanent, single, autonomous self. During the second turning, he elaborated on this and made clear that form, shape and colour, for example, have no independent existence at all—therefore the ‘Heart Sutra’ famously says, “Form is empty, emptiness is form”. Among the Two Truths, conventional truth is what is designated by worldly convention. Not only is the person a mere designation, empty of independent existence, but the psycho-physical aggregates that are the basis of designation are also empty of any independent existence.